of Jim Wright by the MHRA. The Fate of a Good Man follows the fortunes of Jim Wright, a man who thought that he could help with the health of his community by distributing and selling natural treatments for a variety of conditions. Instead of being seen as a good citizen, someone of value in the community, Jim Wright was investigated, prosecuted and tried by the Medicines and Health products Regulation Agency, a firm within the Government that is totally funded by the pharmaceutical industry and that will go to any lengths to see off the ‘competition’. Jim Wright and his family were raided twice over a three-year period, before eventually being charged on twelve counts. In the trial that ensued at Swansea Crown Court, the prosecuting counsel, hired by the MHRA and not the Crown Prosecution Service, said that Wright was dishonest, a hypocrite and a liar, a man who would do anything to make a quick pound, a man who preyed on vulnerable sick people. 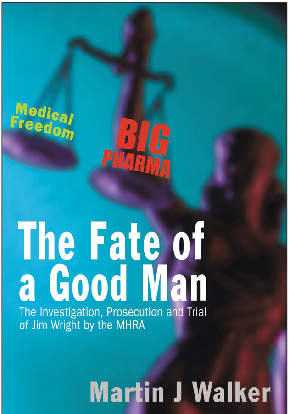 The Fate of A Good Man gives Jim Wright’s version of how he was hounded and then put on trial by Big Pharma.